Frank has started a new blog entitled A Year In Mill Valley. Sebastian say check it out. 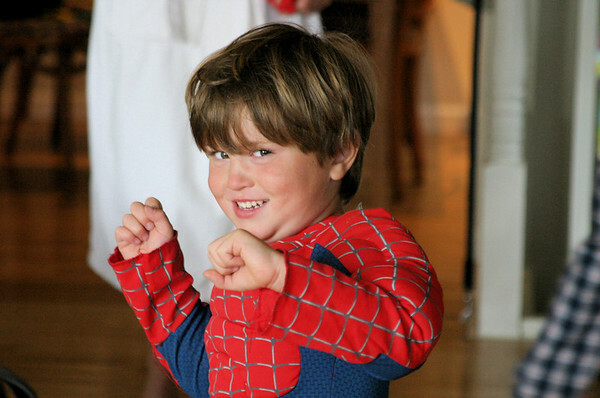 Or Spider-Boy is gonna get you! If you’ve come here looking for our blog A Year In Cornwall, you’ve come to right place. While we’re no longer in Cornwall, the blog is still here, with photos and stories of the almost two years we spent there. It was a time that was both wonderful and difficult, and like many thing in life, if we were to do it again we would do it quite differently…but that will have to wait for a future posting. In the meantime we’re back in Northern California. Nathaniel is in 2nd grade. Sebastian is in pre-school. Rosie (the dog) flew back in February, after we bought a new house. I am currently working as Director of Engineering at a startup in Silicon Valley, and Rachel is starting a new career as a life coach. In other words we’re smack dab back into the life we left behind. I don’t know when we’ll have a chance to live overseas again, but I’m sure we will. I think I’d like to live for a year in the Alps – somewhere where we can put the kids in school, ski for a season, and meet some interesting people. I’ve heard that Canazei, Italy might be a good place – if you think that’s true, or if you know other places we should be looking at in France, Switzerland or Italy, please let us know. Until then, I have a couple of more Cornwall stories to tell…look for them soon. A good friend of ours, Haydn Reiss, sent me an email today about a video he’s just finished on George Lakoff. It’s available as a 25-minute DVD or VHS, from his Win With Language web site ($15). If you haven’t heard of Lakoff, then you probably haven’t been reading many liberal political blogs and press this campaign season. He’s one of the founders of the Rockridge Institute, a think-tank dedicated to helping progressives reframe the political debate by first understanding the conservative use of language, and then helping them build their own common moral language.